Here on the Northeastern United States dragonflies are also referred to as darning needles. These large bugs can live almost anywhere but in the polar ice caps. Averaging about a 5-7 inch wingspan today, dragonflies can reach speeds upwards of 50 mph. With the added talent of hunting by sight, such speeds make them exceptionally accurate hunters of pesky mosquitos and other insects. 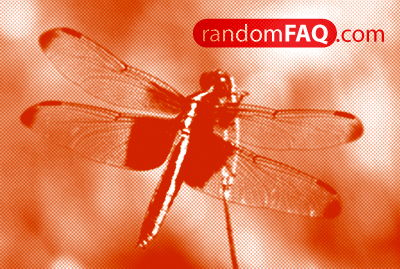 Somewhat erie to think about, the dragonfly is a prehistoric being. Fossils found in the state of Kansas are the left overs from darning needles with wingspans around 2 1/2 feet wide. They were probably eating other things besides insects unless the other bugs were relatively as large. Dragonflies breed and live near stagnant pools of water (yes, swimming pools included) and are know to eat their body-weight in bugs in only 30 minutes.